Tonight after a scrumptious dinner of Sushi with the family, we went next door to the book store. I found an interesting set of books that look like fun. 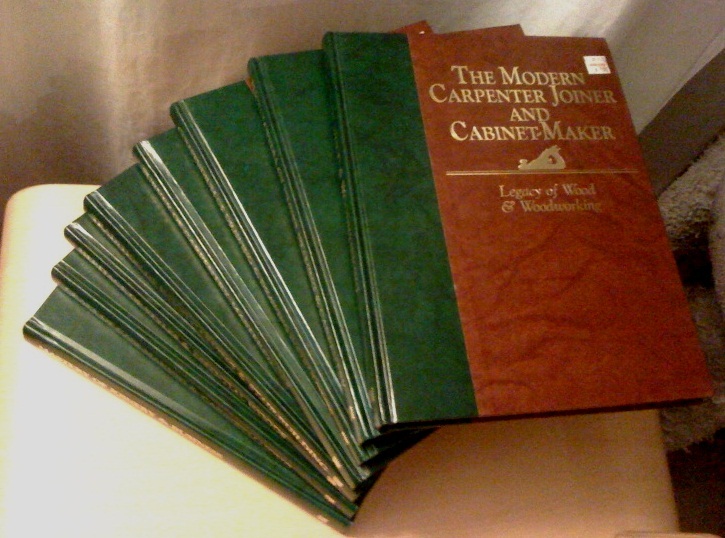 Called “The Modern Carpenter, Joiner, and Cabinet-Maker” it’s a reprint of a 1902 printing, with a new forward by Roy Underhill. For $6 a volume, I couldn’t turn it down. The Modern Carpenter, Joiner, and Cabinet Maker, 8 Vols. Also, today I picked up my books that I’d reserved from the library, notably “Furniture in England: The age of the joiner” which after a brief scan is on my MUST BUY list already. It focuses on the period of 1550 – 1650 furniture with lots of good pictures. All in all a good book day.